Dream of Childhood is a series of images inspired by the heart of my inner child. Private reflections on childhood and the nostalgic magic of it. Moments of living, memories of my own childhood and images inspired by children’s books and stories. Child’s hopes and feelings of all kinds … love, worries, abandonment, dreams of wanna be places where nobody can come unless invited by the very own heart which has created and nurtures our soul. 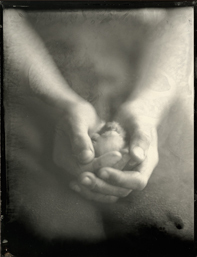 This series was created with large format dedicated wet plate cameras using solely natural sunlight and limited use of reflectors.